Hartville is a city in Wright County, Missouri, United States. The population was 613 at the 2010 census. It is the county seat of Wright County. A post office called Hartville has been in operation since 1842. The community has the name of Isaac Hart, a pioneer citizen. Much of the town was destroyed in the Battle of Hartville in 1863. John Wimer, the seventh person to serve as mayor of St. Louis, was killed in the battle and buried at Hartville. The Grovespring Tornado in 1959 destroyed most of Hartville's business district, as well as the post office. There were no major injuries because a warning alarm had been sounded. Kelton House was listed on the National Register of Historic Places in 1983. 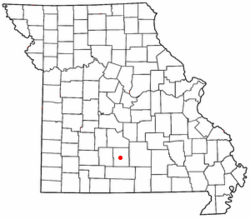 Hartville is located at (37.250170, -92.511916), along the Wood's Fork of the Gasconade River. According to the United States Census Bureau, the city has a total area of 0.66 square miles (1.71 km2), of which, 0.65 square miles (1.68 km2) is land and 0.01 square miles (0.03 km2) is water. As of the census of 2010, there were 613 people, 232 households, and 133 families residing in the city. The population density was 943.1 inhabitants per square mile (364.1/km2). There were 305 housing units at an average density of 469.2 per square mile (181.2/km2). The racial makeup of the city was 97.9% White, 0.5% African American, 0.3% Native American, 0.3% Asian, and 1.0% from two or more races. Hispanic or Latino of any race were 2.0% of the population. There were 232 households of which 31.5% had children under the age of 18 living with them, 37.5% were married couples living together, 14.7% had a female householder with no husband present, 5.2% had a male householder with no wife present, and 42.7% were non-families. 37.9% of all households were made up of individuals and 18.9% had someone living alone who was 65 years of age or older. The average household size was 2.34 and the average family size was 3.17. The median age in the city was 38.5 years. 26.3% of residents were under the age of 18; 8.6% were between the ages of 18 and 24; 21% were from 25 to 44; 22.4% were from 45 to 64; and 21.7% were 65 years of age or older. The gender makeup of the city was 48.6% male and 51.4% female. As of the census of 2000, there were 607 people, 252 households, and 143 families residing in the city. The population density was 974.7 people per square mile (378.0/km²). There were 289 housing units at an average density of 464.1 per square mile (180.0/km²). The racial makeup of the city was 97.36% White, 0.99% African American, 1.15% Native American, 0.16% Pacific Islander, and 0.33% from two or more races. Hispanic or Latino of any race were 0.66% of the population. There were 252 households out of which 28.2% had children under the age of 18 living with them, 43.7% were married couples living together, 9.9% had a female householder with no husband present, and 42.9% were non-families. 38.1% of all households were made up of individuals and 27.0% had someone living alone who was 65 years of age or older. The average household size was 2.16 and the average family size was 2.91. In the city, the population was spread out with 22.7% under the age of 18, 8.4% from 18 to 24, 20.4% from 25 to 44, 21.1% from 45 to 64, and 27.3% who were 65 years of age or older. The median age was 44 years. For every 100 females there were 80.1 males. For every 100 females age 18 and over, there were 77.7 males. The median income for a household in the city was $17,222, and the median income for a family was $27,115. Males had a median income of $20,000 versus $17,969 for females. The per capita income for the city was $11,360. About 18.0% of families and 24.3% of the population were below the poverty line, including 22.1% of those under age 18 and 32.0% of those age 65 or over. Hartville, Missouri Facts for Kids. Kiddle Encyclopedia.